Accreditation is an important element of the education process because it helps to ensure that students are working toward completion of a degree that meets with common standards and requirements in the professional field. Accreditation is also required when transferring to a different institution and often for entry into a graduate degree program. 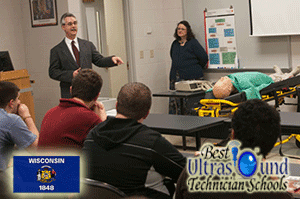 In Wisconsin, there are several accredited programs to choose from. The accrediting agencies for these schools are the Joint Review of Commission on Education in Radiologic Technology (JRCERT) and the Accreditation of Allied Health Education Programs. The growing need for qualified professionals in the field of sonography has increased demand for accredited, respected programs. In Wisconsin, prospective students can consider a number of different options for completing an education to prepare for entry into the field. The American Registry for Diagnostic Medical Sonography is the certification board for these credentials. The ARDMS designation is earned after successfully completing the examination to show competency in sonography for abdomen and obstetrics, gynecology, and breast. The RDCS credential can be earned after successfully completing the examination for adult echocardiography. The RVT certification can be earned after passing the examination for vascular ultrasound. To be a professional in the state of Wisconsin, diagnostic medical sonographers will need to obtain the appropriate certifications. Qualified, certified sonographers are needed and employed throughout the state of Wisconsin. The majority, however, work in the metropolitan areas of the state, such as Madison, Green Bay, and Milwaukee. Additionally, the job outlook through 2022 is also better than the average, with an estimated 39 percent rate of growth for the profession. In Wisconsin, professional ultrasound technicians also have a high annual salary average. According to the Bureau of Labor Statistics, the annual average salary for diagnostic medical sonographers in the state of Wisconsin ranges from $72,871 to $84,220. Additionally, as of May 2012, there were 1,000 employed diagnostic medical sonographers in Wisconsin. Aurora St. Luke's Medical Center-School of Diagnostic Medical Sonography 180 W. Grange Ave.
Best Ultrasound Technician Schools website was built to serve as the best resource for anyone looking to learn more about ultrasound technician training, ultrasound technician certification, jobs, salary, classes and more. The main duty of an ultrasound technician is using special equipment to capture images of a person’s internal body parts, which are analyzed to make medical diagnoses.